I have replaced previously medium quality images with high quality of a photo session that Hugh did back in 2009. You can view the album by clicking the thumbnails below or the gallery link. There is a remarkable moment between Hugh Dancy, as Will Graham, and Mads Mikkelsen, as Hannibal Lecter, late in the second season of NBC’s bloody good “Hannibal.” Together in Lecter’s office, the doctor and his patient are beginning to face off as Will tells Hannibal that he’s fantasized of killing him. “How would you do it?” Hannibal calmly asks. “With my hands,” Will says. But first Dancy pauses for a length of time not typically seen on network television and certainly not on what is, at its core, a high-concept procedural. But those lulls amid the gore are one of the many things that set this stylish series apart from its network cousins. Returning June 4 for its third season, “Hannibal” is loosely based on Thomas Harris’ 1981 novel “Red Dragon,” which first introduced readers to the cannibalistic Hannibal Lecter as a psychiatrist aiding the FBI and Will Graham from behind bars in the hunt for a serial killer. 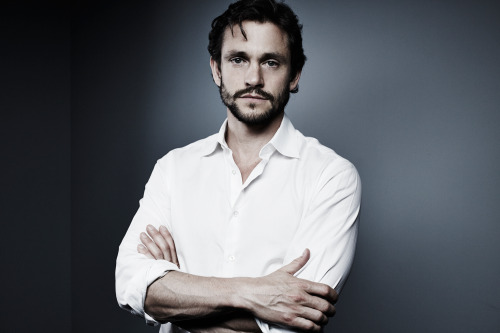 Dancy, the British heartthrob best known at the time of his casting for such films as “Confessions of a Shopaholic” and “Adam,” admits he hadn’t read the novel and “had no real understanding or conception of Will Graham as a character” when he signed on for the role. In Fuller’s version, Will has been deemed potentially mentally unstable and referred to psychiatrist Hannibal, who recognizes the darkness within Will and goes to great lengths to exploit his fragile mental balance, which includes luminous, terrifying fantasies and lost time. But keeping track of the storyline, the plot twists, what is fantasy and what is reality, and whether Will is fascinated by or wants to brutally murder Hannibal, are constant and dizzying challenges for Dancy. Another element that needs continuous defining is the relationship between Will and Hannibal. “The headspace is so abstract in terms of where he is in relation to Hannibal at any given time,” Dancy points out. “Do they love each other? Do they hate each other? Are they just pretending? Does he know that I know that he knows? Is it a game? Is it another game? “I mean, there was a point in the beginning where Mads and I were just basically making our best guesses based on what we knew about the episode that we were currently shooting and hoping that we wouldn’t get a scene that just convoluted us,” the actor adds. Dancy explains Hannibal as “the still point to a turning world while Will is constantly shifting,” and while most actors on television grasp their characters eventually, Will remains a mystery to Dancy—something he hopes enhances his performance. “A point about Will is that he doesn’t know who he is and Hannibal knows who he is; [Hannibal] may be a nasty guy, but he’s so happy. He’s much fun. He has no qualms. So if you kind of resolve that about Will, or if I felt resolved about it, I think it would become quickly redundant,” Dancy says. But while he claims to thrive in the unknown, Fuller can attest that the actor knows more than he lets on. “When we sat down with him, he was so insightful about the character right off the bat,” Fuller says. “He has such great ideas and insight that I end up rewriting the scenes to include a lot of his ideas because they’re so rooted in the world and in the complications of the character. “We do call each other in the middle of the night and go over scenes that we have to shoot tomorrow and figure out how we can either improve them or understand them,” Mikkelsen says. I have added three additional outtakes from a photo session Hugh did back in 2011 to our photo archive. Thank you to my friend Annie from anna-torv.net for sending these our way! I have replaced three photo session images in our photo archive with higher quality versions. I have added a portrait of Hugh from 2004 to our photo archive. You can view the album by clicking on the photo below. I have replaced our previously medium quality images from Photo Session 003 from 2003 with high quality images. You can visit the album in the gallery by clicking on the thumbnails below. I have replaced the previously medium quality images of photo session 002 from 2005 with high quality versions in our photo archive. I have added another addition to the 2014: 003 album in our photo sessions section of our photo archive. You can go to the album by clicking on the preview below. I have replaced Photo Session 005 from 2011 with High Quality. You can go to the album by clicking on the thumbnails below. I have added three additional images to Photo Session >  002 in our photo archive.